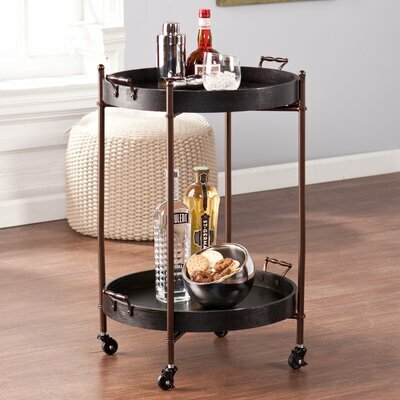 I've been searching for the perfect bar cart for quite some time and as soon as I saw this one, I knew it was meant to be. The bar cart I was looking for needed to be small since we really don't have that much room to spare in our dining area, but obviously tall enough to fit the big bottles that we have in our liquor cabinet (many of which were too tall to fit inside). This one not only has wheels that lock the cart in place, but the two round trays are removable so if we ever need to use them separately, we can fit quite a bit on here. I imagine using these for Thanksgiving and larger gatherings where we will want to use both rooms to entertain guests. The price was certainly something that helped in this buying decision. I wanted something under $100 and with the promo code that came in the mail with the Wayfair catalog, I was super happy with the end cost (with free shipping that delivered this one to our house in 2 business days). When it arrived, I was a bit nervous about the assembly, but it was as easy as it could possibly be. I simply had to screw in the four wheels, open the X-shaped cart and locked it into place and then set the trays inside. It was ready to go in less than 10 minutes once I got the pieces out of the packaging. It not only looks great, but I love having a bar cart that did not have glass shelves...the liquor bottles are fragile enough and since we have active kids and a cat, I didn't want to worry about something bumping into it or landing on it and having it break. This is a really cute cart. I like that it is not big either and I like the color.